A goddess bowl is a bowl meal with ingredients blended for culinary and magical properties. I make them regularly for the Moon Goddess Yoga Retreats I run in Cornwall, and for myself. You may have seen these bowls called buddha bowl, soul bowls and/or nourish bowls. We are essential creating an edible spell or potion. 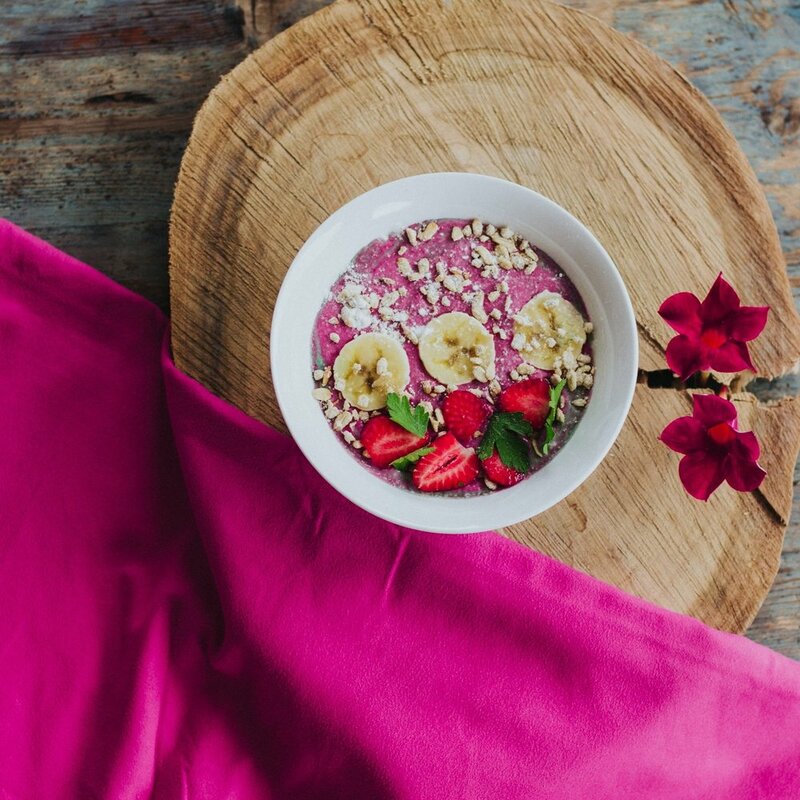 The ingredients I’ve outlined should help you put your own unique breakfast bowl together, to start your day with magic and love. Raspberries: Fruit often symbolises the divine Feminine, and raspberries are also connected to love and protection. Maple syrup: In kitchen witchcraft, maple charges food with moon energy and healing properties. Cinnamon: A warming spice, associated with fire, energy and healing. Coconut: The coconut is thought to enhance the purity of love, dispel negative energy and replenish good energy. According to polynesian legend, when the moon goddess Hina fell in love with an eel named Tuna, her brother, Maui, killed it by cutting off its head. Maui told her to plant the head in the ground which then grew into a coconut tree. So something good came out of the whole debacle! Fig: In Greek mythology, figs are sometimes associated with Dionysus god of wine and drunkenness, and with Priapus, who symbolized sensuality. The fig tree has a sacred meaning for Buddhists as well. According to Buddhist legend, the founder of the religion, the Buddha, achieved enlightenment while sitting under a bo tree, a kind of fig tree. The bo or bodhi tree remains a symbol of enlightenment. Pear: Pears are sacred to several goddesses: In greek myth to Hera and Aphrodite. In Roman Myth, Goddess Pomona, goddess of gardens and harvests. Pomegranate: Its many seeds made it a symbol of fertility. In ancient Rome, the pomegranate signified marriage, and brides wore pomegranate-twig wreaths. Strawberries: Because strawberries are the first fruit of the year to ripen, they are associated with spring and rebirth. For your ‘base’ this is the main body of the breakfast bowl, and then you can get creative with extras of fruit, nuts and seeds! In a small pot, bring almond milk just to boil. Reduce heat to low and add oats and coconut oil. Stir for a few moments and allow to steep for 3 minutes. Add a little extra milk if needed. Option: add a teaspoon of cocao powder for a even sweeter treat! Put all your ingredients in a blender and whizz for a few moments! If you are in a rush, add a little extra milk and this makes a lovely smoothie drink. Newer PostWhat can we do throughout our day to remind us of our goddess nature?